A composite team formed by the provincial government to inspect the Virgin Island in Panglao called out the municipality’s local government unit (LGU) due to the apparently inadequate waste disposal system and alleged illegal structures in the tranquil island which is among the town’s top tourist draws. 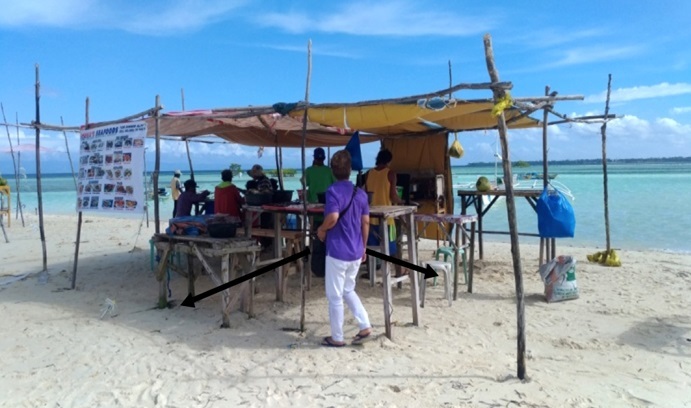 Structures made of light materials including that of food vendors have been established in a segment of the island which is a violation of “Presidential proclamation 1801 declaring Panglao Island as Tourist Zone,” the inspection team said in its findings presented before the Panglao Island and Tagbilaran Executive Council (PITEC) last week. “The island should be free from any commercial activity, consistent with Presidential proclamation 1801 declaring Panglao Island as Tourist Zone. The Virgin Island must be for recreational activities like swimming and snorkeling only,” the team led by the Bohol Environment Management Office (BEMO) said. The environmental team called for the LGU to stop the issuance and renewal of permits to vendors and to demolish all light-material structures across the island once existing permits expire. It was also pointed out in the report that some vendors did not even possess permits to operate in the area. “One of the vendors said that they have been in the area 10 years ago in the Isola de Francisco but when the claimant started developing his ‘titled’ island, they were ordered to vacate the area and decided to transfer in the sand bar,” the report said. The island’s waste disposal practices were also raised before PITEC officials as the team noted that there were scattered garbage in various segments of the white-sand beach. “Garbage were placed on sacks and allegedly brought to the mainland for disposal. No segregation of waste is being practiced. Some vendors even throw the garbage on the sand,” it said. According to the report, there were 11 food stalls with tables, chairs and portable stoves erected in the island. These establishments, some of which also use firewood to cook food, prepare dishes ordered by guests. The team also recommended that the municipal government should assign its Bantay Dagat team to monitor the area; strictly implement proper garbage segregation and disposal; review the CRM Plan and Zoning Ordinance on the designation and utilization of the area and implement the same; and include this concern in the discussion of the PITE (Panglao Island Tourism Estate) Review and Development Committee (REDCOM). The inspection team included BEMO acting head Jovencia Ganub, MariaVilla Pelindingue of the Coastal Resource Management (CRM) unit, and Melanie del Valle of the Ecological Solid Waste Mangement unit from the provincial government; Bantay Dagat staff from LGU-Panglao; and PROCESS Foundation executive director Emilia Roslinda, representing the non-government organization or the civil society organization. They were deployed to the island a day after Chatto on April 13 called for the inspection during a Provincial Development Council Executive Committee meeting. The BEMO then “directly coordinated with Panglao CRM Officer Darwin Menorias and proceeded with the inspection on April 14.